18) of Creame warmed, a pound and 1/2 unwashed Currence, pick them well and rubb in a Cloath, put in a Little sack a little nutmegg, rubb the butter well in ye flower to make this up in an oven almost as hot as for a Little penny Loafes. Lett them Stand 1/2 an houre till you See they be Colloured of both sides then take downe the oven [illegible], and lett them Stand a qr of an houre to soake. how to fry Oysters. make a batter of Eggs the Yolks and flower, with a Little sugar, and sinamon, and rowle your Oysters - being parboyled within the batter, & fry them in butter and serve them away with Slices of Lemmons, and fried parsley: you may laryd your oysters with bacon if you please. To make marrow pyes. Take your marrow and lay it in water to Soak out the blood then put in the Yolks of 3 Eggs boyled hard quartered in 4: then take sliced dates and mace and Season it with Salt, then close it up in fine past To make a Pye of Roote of Bulloks mouth Take a Roote of a Bulloks mouth: boyle it and blanch it as you do a neates tongue. 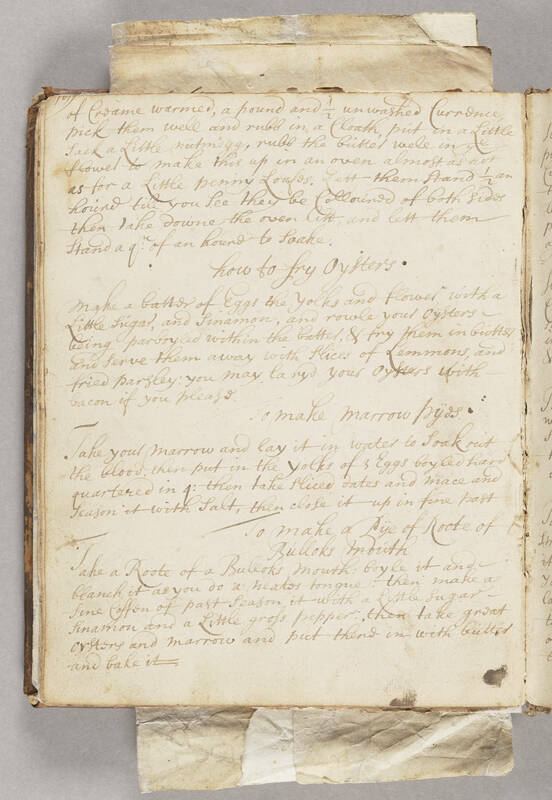 then make a fine Coffen of past Season it with a Little Sugar - sinamon and a Little gross pepper: then take great oysters and marrow and put there in with butter and bake it.